Europolity. Researching Policy, Inspiring Politics. November 23, 2014 / alexandra / Comments Off on Europolity. Researching Policy, Inspiring Politics. Centre of European Studies – a teaching and academic research structure. Europolity releases the call for the June 2019 issue! 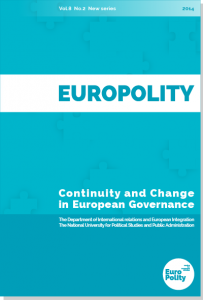 Europolity is a leading international journal for publication of new ideas, research results and fundamental advances in all aspects of International Relations, European Studies and Political Science. Europolity publishes well developed innovative articles, in English, and encourages emerging researchers to share their professional and academic knowledge. Contributions regarding international relations, European studies, political science, security studies and other related fields are strongly encouraged.